Ready to make some cultured butter? It starts with cultured cream… and it's so easy! Not to mention, full of fat-soluble vitamins and probiotics. First, there are a couple ways to turn sweet cream into cultured cream. Take a combination of sweet cream and already-cultured cream (such as cream skimmed off the top of raw yogurt) and let culture together in fridge for a week or so. *Meosphilic culture (1/8 teaspoon mesophilic culture per 1/2 gallon cream), buttermilk or piima culture (1 to 2 tablespoons per 1 pint cream), or even kefir grains! Once cream is cultured, move to fridge to chill. 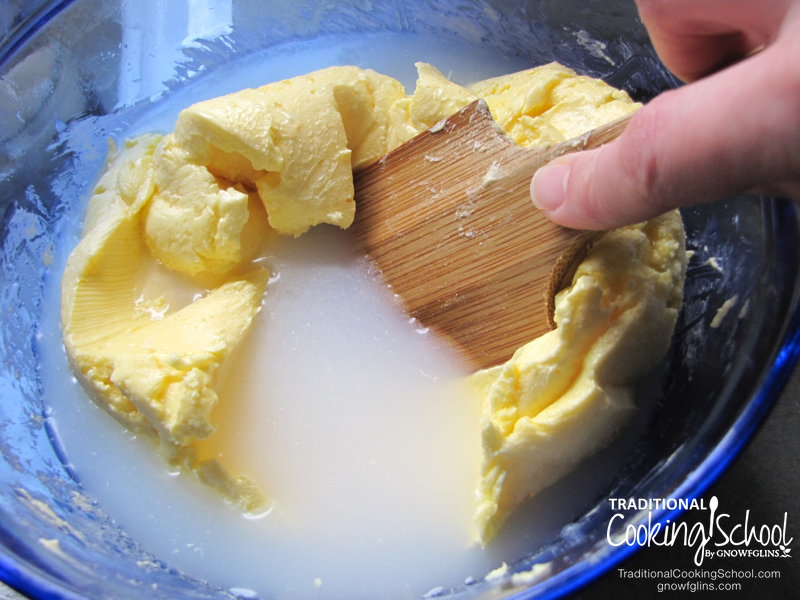 Once completely chilled, move to room temperature about 1 to 2 hours before you plan on making cultured butter. I actually use the above method #3 — I collect cream from the top of our jugs of raw milk and even our already-cultured raw yogurt. Then I let it sit in the fridge in jars, slowly culturing, while I build up enough to make a big batch of cultured butter. I then move it to room temperature a couple hours before I start to make the butter. Whichever way you choose, the cultured butter will be delicious and full of beneficial bacteria! Put on the lid of whichever appliance you're using, and turn on. The process of churning may take between 5 and 10 minutes. If you're using a blender such as a Vitamix, use the tamper to keep the cream circulating and make sure to blend on setting 5 or 6 so the butter doesn't heat up. The cream will go through several different stages on its way to cultured butter. First, it will expand and become whipped cream. Then the butter solids will start to clump together and separate from the liquid (buttermilk). The whole mixture will look grainy. The solids will continue to clump together until big chunks of butter are floating around in the buttermilk. Churn just a minute or so more to complete the process of clumping the butter solids. 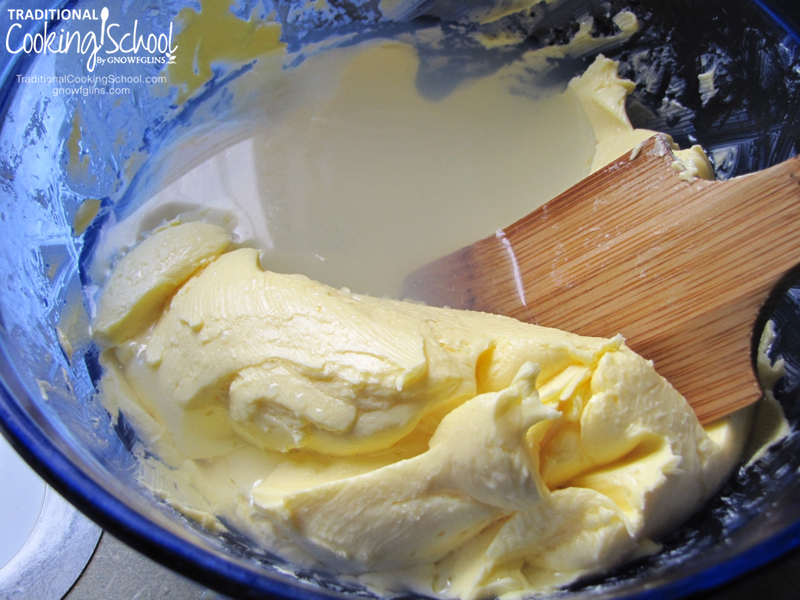 Transfer butter solids to a large bowl using a sieve to strain out the buttermilk. If you'd like, collect the buttermilk to use in baking, smoothies, for soaking grains — you name it! Repeat the above process until the rest of your cultured cream is processed into butter solids and collected in the bowl. Now, add cold, clean water to bowl. Use a hard spoon (such as a bamboo spatula) — or if it's a large batch, use your hands — to press and fold the butter into the sides of the bowl. The water will turn cloudy as the remaining buttermilk releases from the butter solids. Change the water repeatedly as you wash the butter. Once the water stays clear, you have clean, cultured butter! Discard the washing water for your animals or the compost — it isn't true buttermilk because it is too watered down. Press and fold the butter a few more times to release any trapped water. Mix in sea salt, to taste. 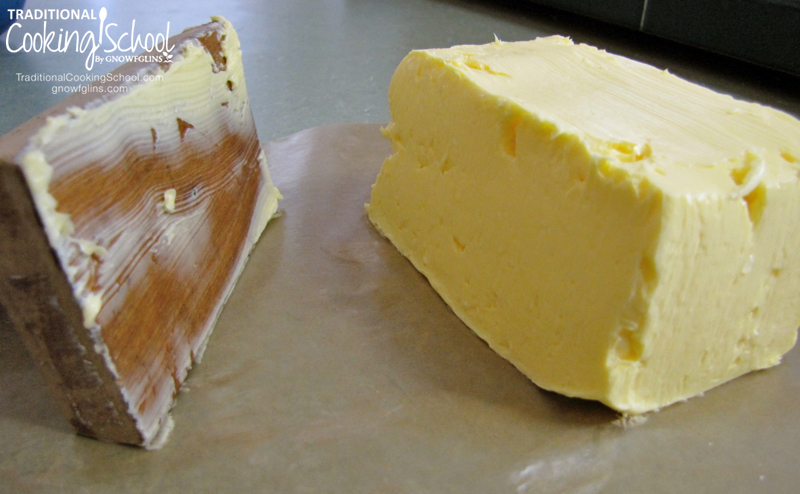 Transfer butter to a butter mold — or shape it into logs. If using a mold, transfer butter to mold until full. Scrape off the mold. Release the butter from the mold onto a sheet of natural wax or parchment paper. Whether you've molded or just hand-shaped your butter, gently wrap it in the parchment paper as it will still be soft. Transfer to freezer if not expecting to use right away (make sure to put wrapped butter in a ziplock bag for better storage), or store in the fridge if you're planning on using within 1 or 2 weeks. The more buttermilk you rinsed out of your butter, the longer it will last. Enjoy slathered on fresh toast, or with your morning eggs, or however you desire! Have you eaten or made cultured butter? How do you like it? What a great post! I hope to have enough cream again to do this. As you know, I actually was able to culture the cream with a bit of kefir! I have a half gallon of raw cow milk that has soured. This usually doesn’t happen here since we drink it fast. What do you usually do with soured milk? I was debating on leaving it out to separate, but I just stuck it back in the fridge. Wardee, I attempted to make butter in my blender tonight. It started to look like it should, thicker and more yellow, but not yet clumpy, and then it turned back into looking like cream. Any ideas why? And now what should I do with it? It isn’t butter, and I have no idea how I can use it or if I can use it for anything. Julieanne — What temperature is it now? I wonder if it heated up in the blender? That would prevent it from “breaking” into butter. I’d try chilling it and then using a mixer or food processor to try again. I looked online again, and none of the tutorials’ photos anywhere looked anything like my “butter” did tonight. Also used the rest of my cream to try to do this in the KitchenAid after looking at tutorials for that. Same thing happened. No butter. Well, after I rinsed it all, I think I ended up with 1 tsp. of butter, from 8 cups of cream. I feel so badly – this was a very expensive mistake and a waste of my evening. 🙁 Sometimes when I try to do things healthier and right, they don’t turn out, and I feel like giving up. Especially after using the cream from 3 gallons of raw cow’s milk, and having nothing to show for it. I was so frustrated that I threw it all out. I wish I knew how to make butter so that it would work for Kelsi. She’s fine with the raw cow’s milk that we are now able to buy (!!! ), so I was hoping she could use that butter so I wouldn’t have to buy trash margarine for her to use in the baked goods we make. We don’t need it very often, because I dislike using it so much, so I was really hoping that this would work for us. It was strange. In the KitchenAid tutorials I saw, the cream got thick like whipped cream, and then did what I would expect it to do – get clumped a bit with obvious butter and buttermilk that were generally separate. But mine never did that at all. I stored the bottles of milk in my fridge overnight without disturbing them so that I could skim off the full cream. I stored the cream in smaller pint jars in the fridge. Everyone told me to take the cream out of the fridge 30-60 minutes before using it to make butter, so I did that. Oh, well. I just feel like I’ve got to figure this out, though, because I really would like us to be able to eat raw butter instead of buying organic butter from the store. I could cry right now, but I’ll pray about it and trust that with the Lord’s help I’ll figure out some way to make butter in the future. It is best either cold or just 15 to 30 minutes out of fridge. In summer it can get too warm fast out of fridge. Also only the heaviest cream makes good butter. If the cream is too light it won’t make butter. I usually skim only the top firmest cream for butter and the rest is creamer for drinks or ice cream. Julieanne, I have had this happen a few times..Two things..One let yer cream culture for a few days..Let it get just a little tart smelling..and Keep it chilled. The mixer method DOES warm it up and basically what happened is you were beating at too high a speed and it warmed up and collapsed..N it is NOT ruined..Put it in the freezer for twenty minutes and mix at low speed. Mine usually reocovers from this treatment. I have had it take as long as an hour to do so. I also use the marble in a jar method and same thing HAVE to keep it cool. The fat sticks together and the milky stuff seperates. This is caused by centrifugal force(in other words gravity. DO NOT use high speed to make yer butter unless it is VERy very cold. I have only used low speed since learning this and i does not take as long. Good luck Lady and hope it turns out better for you. Cant wait to try this! I dont have raw cream so im using my kefir grains. No idea how i will find them looking at the cultured cream. But it looks damn tasty already. I brought cheap super market cream to try cultured butter. Next time i might try to find organic grassfed cream. Tara – I would bake with it, or turn it into soft cheese. You can add rennet and let it set up, then drip it out through cheesecloth like the Fundamentals eCourse lesson. If you let it separate, you can drip it out then for cheese. When I said bake with it, I meant use it for soaking my baked goods. I don’t cook good raw (even soured) milk without a very good reason! It would also be good in a smoothie. I just recently took my heaving cream that was souring too much for my tastes in coffee, but I thought might make tasty butter, and put it my food processor. I knew it was thick, but was surprised when it turned to butter in less than a minute! It was mostly butterfat. And man, oh, man, was it some tasty stuff. I cooked some sliced carrots in it and then added a bit of chicken broth to feed to my toddler. Yummy! It really made plain carrots into something special. Do you ever make butter from you goat milk? I’ve read that separators are expensive. Love this idea your taking on “Probiotics” every meal each week. Great direction! Now maybe my husband won’t think me a little tetch in the head for all the times he’s found me eating sauerkraut for breakfast with whatever else I’m having….LOL!! What can I say, I love kraut. 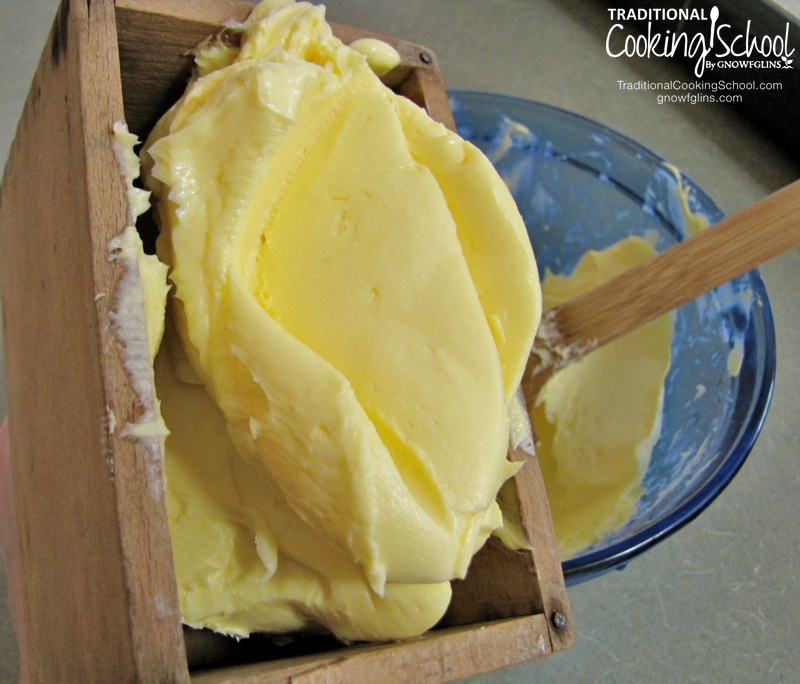 Enjoyed this post…….I had a failure with the cultured butter I did yesterday. Live and learn. The pig enjoyed the failure though! Nothing ever goes to waste if you’ve got a pig or chickens. Just called my farmer gal “keeper of the grass fed jersey cows” to see if I can get an extra 2 gallons tomorrow on my milk run so I can have extra cream on hand for butter making. Although I may have a fight on my hands for the cream to be made into ice cream, but I think the butter will win. 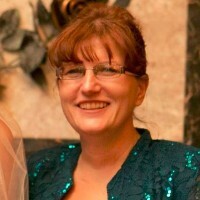 Pamela – Here’s hoping the butter wins! Quite a difficult decision – butter or ice cream. So tough! Sorry your last butter attempt didn’t work. I don’t have an answer for him on that one. What do you think Wardee? If you have kids you can let them make butter but putting the cream in a mason jar, put a tight lid on and let them just shake shake shake it! It’s fun to see all the changes too and feel it how it goes from milky to the thick frothy stage (where you almost can’t shake it), till you start to feel the butter forming and jumping around in there then you see the lump of butter and milk. I did that recently with just a small leftover pint of cream I had in the fridge and I just wanted to try making butter with it. I just poured the “butter” milk off into another jar and saved it and just put it in pancakes ( I realized later that it’s not true buttermilk, I guess you have to culture it afterward?) but it was fun and the butter was delicious. Wardee is correct, butter oxidizes and spoils at room temperature. The reason this happens to butter and not the original cream has to do with the size of the water droplets that are emulsified with the fat to form the butter. With raw cream, the bacteria in the cream is able to build and naturally culture the butter but the small size of the water droplets in the butter cause the butter to instead become rancid. I was a bit tired of the cultured taste and so I added some store bought buttermilk to my cultured cream and left it over night to develop. Then I chilled it and made the butter. It was strangely whiter in color but it was soooooooo good in flavor. Nothing ever goes bad at my house any more…. it just ferments! BTW – I kept this butter in a container in the refrigerator. It melts/softens real quick unlike store bought butter, so it isn’t a problem. Reminds me of how coconut oil behaves – from hard to soft real fast with just a little heat. I was culturing (with a little bit of cultured raw buttermilk) some raw cream to make creme fraiche (sp?) and accidentally left it longer than the 20-24 hours. I actually left it about 34 hours and it looks like it is just starting to separate. My question is will it be okay as creme fraiche or should I try to make cultured butter with it? Or, is it bad since I left it longer than I was supposed to? I’m brand new to raw milk/milk products and culturing, so any help would be greatly appreciated! Thank you Wardee and Julie for your answers. That makes perfect sense. My husband was satisfied with that answer, he’s one of those ‘why?” people. KC — Freezing is fine for probiotics. In fact, a great way to make them last! Will see what we like best. Or just culture every now and then or so. Im embarrassed to say that I was actually throwing out my raw cream when it began to culture as I thought this meant it was off. Boy do I have a lot to learn! Heehee. Kamille — Do you mean a 1/2 gallon of cream? It depends but generally you can expect half as much butter as cream. In terms of pounds, I’m not sure what that would be. If you had 1/2 gallon of cream, you’d end up with about 4 cups of butter. Oopps–I meant cream, not milk. In the post you wrote that you started with 1/2 gal of cream and I wanted to know the ending results. 4 cups would be about 2 lbs. thanks! Hi! I have a question for you. I just made some cultured butter from grass fed cream that I added some homemade yogurt to culture it. After I strained the buttermilk out from the butter(I used a clean pillowcase since I don’t have cheesecloth) there was a really thick cream left in the with the butter and on the sides of the cloth it looks a lot like the cheese you get when you strain the way out from yogurt. Is it really cream cheese or what is it? Thanx in advance if you can help me! I’m so sad : ( I broke my food processor making butter last night! I’ve made it several times before. This time, I was about 2 minutes away from the butter chunks forming when the sound of the motor changes and the blade stopped spinning. The top piece of the lid that presses down into the central tube that turns the blade got so hot that it melted onto the metal spoke, essentially rendering it useless like a stripped screw. This is the 2nd food processor I have broken in a year! I tried transferring the cream into the blender but that didn’t work. So I finished whipping it by hand and got the butter to form. I just invested in a slow cooker finally this week, so I don’t have the funds to replace my food processor right away. argh, but thankful to have nutritious food and praising the Lord for his goodness anyway ! Is anyone else having trouble with this website being really slow or is it my computer? Anyway…it is a very helpful site! So, I tried making butter in my Vita-Mix on low and it didn’t work, It barely did a thing after 1/2 hour. I can make whipped cream in seconds in it on high, so we had, after trying low and medium, tried high to see if it made a difference. Nope. And it started to heat up. We rechilled it and tried again, and got a sour cream consistency but that’s all it would do. So then I read not to use a Vita-Mix. So will re-chil and try again in a blender with a wisk attachment, though I must say, the sour cream is tastey anyway. QUESTIION: I read elsewhere about what to do if a mold blob appears on top of soured milk, but I forget what it said, though it said the milk was still useable. If ever find this blob, do I mix it in, or take it off? QUESTION: Also, can I leave the jar of milk on the counter with it’s lid on to further sour it, or must I use a cloth cover? Is this what is called “clabber” . I read that this clabbered milk was good to obtain but foget what to do with clabbered milk. Thanks! Hi, I’m wondering if the resulting buttermilk from the cultured butter can then be used as a starter to make more buttermilk using it and raw whole milk?? I would like to try some cultured butter, but I don’t have raw milk. I DO have lots of water kefir – I don’t do dairy kefir, since I avoid dairy, but butter/milk fat is okay. Do you think that it will work to culture the cream with water kefir? I have been making butter from cultured cream now for over 12 months. I also have been making cultured sour cream among other cultured milk and cream products. I have found that on occasions from one batch to another from the same farmer I’ll find that the cream just wont culture quite right. some times it just doesn’t seem to work. any thoughts on what is going on? I am getting frustrated with it because when it works it is wonderful but i can’t figure out why it is working some times and other times not. So if I have raw fresh cream, do I need a starter or at all? Could I just place that on a counter for 24 hours…? Thanks! We bought our first organic raw milk 2 weeks. Of the plastic bottles we poured some cream into a stainless steel milk can. We took some of this fresh cream to try and make butter, but it did not beat well the first day. Why? Then we let the rest sit in the fridge. Looking at it today it has a brownish skin in parts and has already separated into curds and whey it seems. The brown skin looks a bit intimidating and even though the smell from the can is not too bad I would almost think to have to toss the brown skin or not? We would be honoured if you could reply to this. Thank you. I was making cultured butter from raw cream for 2 years. I then started getting raw cream and milk from a local farmer who had only a few cows instead of 200. They are grass fed Jersey’s instead of oat and grain fed Holsteins. For some reason, the cream will not culture and it does not churn into butter as successfully. Do you have any thought’s or suggestions on this issue? Hello!! This is a great post, as usual. I’m sorry if you had already explained this. Can you please give me some advice, and in turn help anyone else out there as clueless as I am (if that’s even possible! lol) in regards to culturing naturally? If a person has access to raw cream, then they don’t need to get a culture starter, right? I leave the cream out for 24 hours (covered with a cloth) as you’ve mentioned above? So, after the allotted time, I transfer the raw cream to the refrigerator. to slow down the culturing process and to make it cold enough for butter making? maybe an hour or so? The resulting buttermilk from that cultured raw butter is now cultured raw buttermilk? Something I can then use as a cultured buttermilk to make future batches of cultured buttermilk or to culture fresh raw cream faster? Over and over? I also have the option of culturing slowly, by buying the fresh raw cream and immediately putting it in the fridge, not leaving it out. Leave the raw cream in a glass jar with a screw on lid in the refrigerator for anywhere from 1 1/2 – 2 weeks (undisturbed) and it will automatically be cultured cream? You can leave raw cream out to culture naturally. 24 hours should work unless your house is very cold then it may take longer. Yes, after the allotted time, move it to the fridge to cool for ease of butter making. I usually move mine over in the evening to make butter the next day. The buttermilk that comes off of butter is different than a cultured buttermilk. It doesn’t really work to make future batches of buttermilk. You can drink it (tastes great with a little salt) or use for baking, soaking grains, salad dressing, etc. Yes, you can culture slowing in the fridge. Enjoy! I have a question, but first…. Oh my, I love you, Wardee. Just discovered you—maybe five days ago?—but it seems longer because I’ve been kind of binge-watching, searching, souring, and reading ever since. I love listening to your voice and your heart and your wonderful way of explaining things. You are a gifted communicator and excellent teacher. Q: Is there a way to culture raw “buttermilk” (by which I mean the liquid by-product of making butter from raw cream) *after* I have made the butter? Can I just let it sit out in a covered jar and the organisms will do their thing? Today I am trying for the first time leaving the jug of milk at room temp till tomorrow so it will be thicker when poke a hole to try to save only cream for butter but not sure that will work any better. I am making butter by just leaving it out this time (first time making butter) and will also try with kefir grains in the future. Wardee uses a 1/4 cup measuring scoop or a ladle to scoop off the top. Here’s a video from the archives! Thank you for this wonderful article! I am trying to figure out if I can use a probiotic capsule to culture the cream? I certainly have plenty of homemade raw kefir in the fridge, but thought I might benefit from using a variety of cultures. I don’t want to buy mesophilic cultures because I am not sure if I can tolerate them with my sensitivities. I like to work with what I know I can tolerate, for now. I can use kefir as a starter if not the probiotic capsules. Thanks! We live on a dairy with what most people would consider grass fed cows. (Dairy cows cannot maintain health just eating grass and must have grain and other minerals. Also “grass” is seasonal so in the winter cows have to eat something else.) We drink raw milk and skim the cream and make butter several times a week. I notice an incredible amount of difference in the butter I make each time I make it! In the summer it is very yellow (probably from eating grass) in the winter it is light yellow. I have even seen it take on a greyish color. Sometimes it is fluffy and other times really firm. Also it seems to leave a lot of grease on my hands when I make it and other times not. Sometimes I can rinse all the buttermilk with a couple washes other times it takes ten rinses and it is still a little cloudy. I know some of this is related to what the cows are eating but what else do you think is going on? Also I have been told that using anything with a blade, like a blender, is the worst thing to use to make butter because the blade shreds up the molecules and will make the butter taste bad. Your thoughts? I prefer to use my blender because it works faster than anything else I have. The difference in texture could be temperature of the butter solids. Yes, color varies season to season. I realize this post was written a while ago so I have a couple of questions. If using the cream skimmed from the top of cultured “cottage” cheese, do you need to add sweet cream (raw/pasteurized) and let it sit in the frig to culture? I thought I would be able to go straight from skimming from culture to making butter. I want to make sure I am understanding correctly. Thanks in advance. Thanks for sharing this recipe! How does changing the butter into its ‘cultured’ version have an effect on the taste? I don’t want my kids to go crazy and shy away from butter if it has a funky taste to it. If its all the same AND I get more probiotics I will be happy as a clam! Thanks again for sharing. 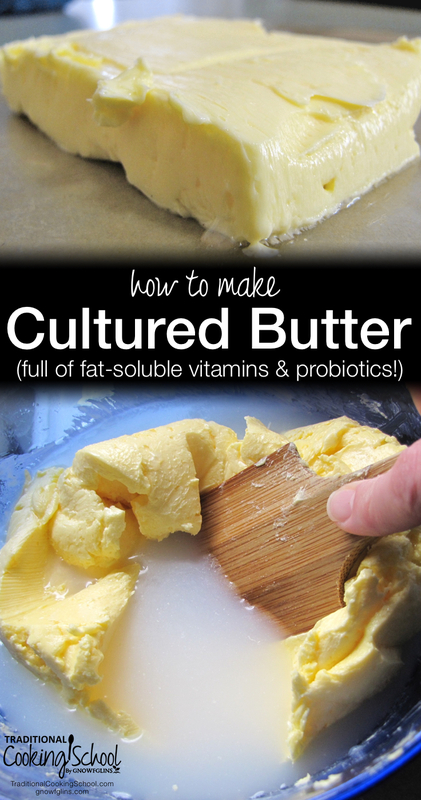 Culturing makes a slightly tangy and more flavorful butter. A little bit like sour cream (since this is essentially what you are using to make your butter). As a child, my family used a gallon of milk every other day, but maybe every day. We’d keep the cream in the refrigerator until we had a little over a quart. Then we’d put it in the glass base of the hand crank butter churn. We’d leave it on the counter until it soured–a day or overnight. Then we’d churn and wash it as above. It didn’t take long to churn. We’d keep the butter in the refrigerator, but we’d always have a half cup or so on the counter to use on bread and toast. It was so easy to cook with since it softened so easily. And it tasted great. My sister and I would read the paper while we churned. Our local historical society has one of the crank churns. Beautiful memories. I have yet to venture into dairy making other than making my own butter. I would like to make cultured butter as I like the flavor better, but…it makes me nervous to leave raw milk out for hours at a time! Would the 24 hour waiting period be less, say, in the summer? And how would I know if raw milk has gone bad? Also, what temperature is the best? How do you compensate for humid summers? Thank you for your help! 24-hours is not a hard-and-fast time. Even in the refrigerator raw cream will ripen on its own. Room temperature is between 68-77 degrees. Fermentation time is often less in the summer because the heat makes the fermentation happen quicker. It could be 12 to 18 hours. We normally don’t compensate extra for humidity, other than allowing for quicker fermentation in warmer temperatures.